If you’re into algorithms, you should absolutely subscribe to the MIT Technology Review newsletter called The Algorithm. Earlier this month, the folks at The Algorithm asked “what is AI, exactly?” The answer is reproduced below. The question may seem basic, but the answer is kind of complicated. In the broadest sense, AI refers to machines that can learn, reason, and act for themselves. They can make their own decisions when faced with new situations, in the same way that humans and animals can. Because of this, the boundaries of AI can get really confusing, and the term often gets mangled to include any kind of algorithm or computer program. We can thank Silicon Valley for constantly inflating the capabilities of AI for its own convenience. It’s good to be reminded of this definition as we contend with the latest releases of the legal research databases as the databases continuously tweak their underlying algorithms — the latest being Westlaw Edge. 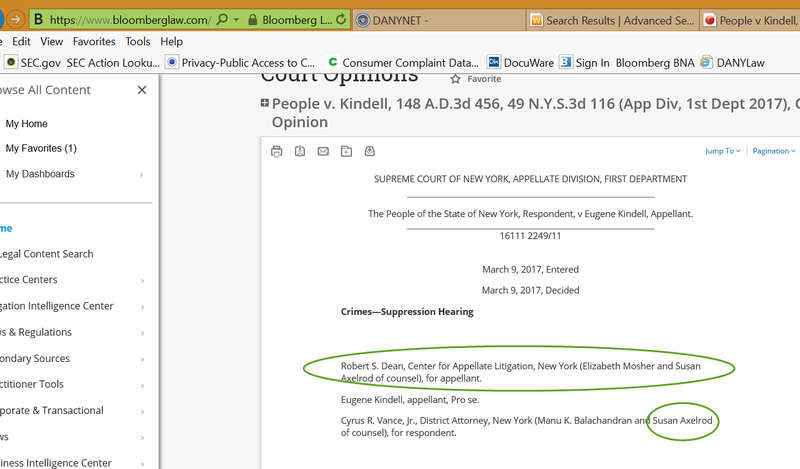 Introducing the next generation of legal search. 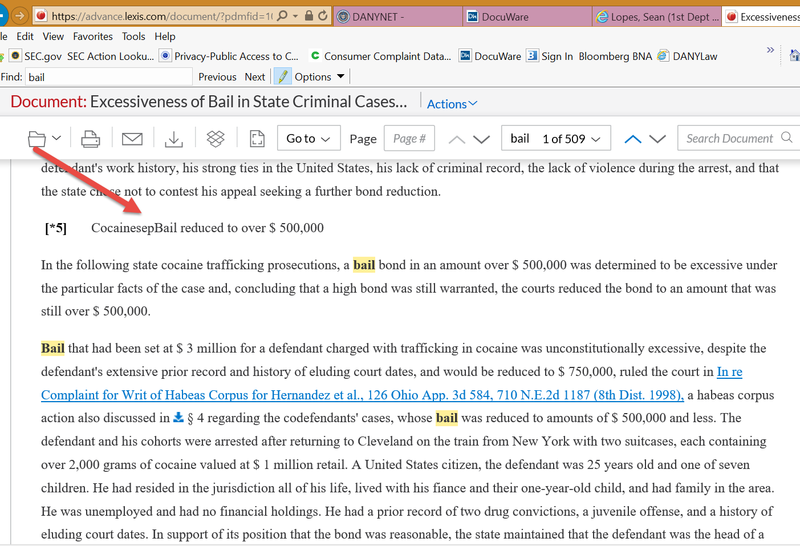 Get superior predictive research suggestions as you start typing your legal query in the global search bar. 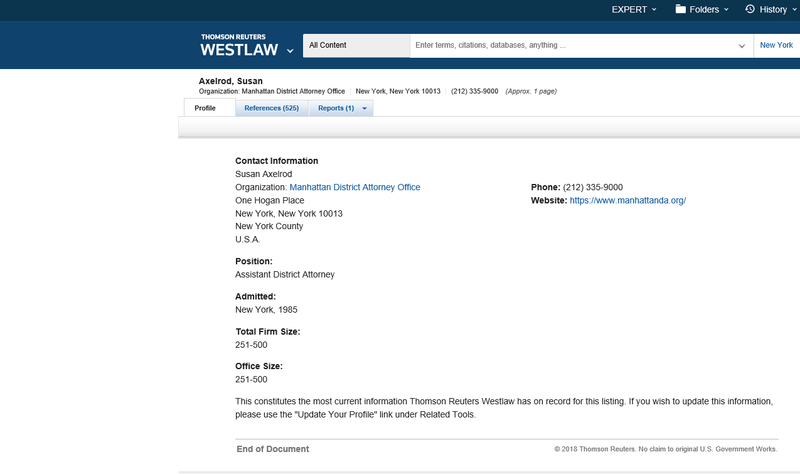 WestSearch Plus applies state-of-the-art AI technologies to help you quickly address legal questions for thousands of legal topics without needing to drill into a results list. We’re starting to see a time when the Google Generation is already predisposed to not drill into a results list and now the databases are actively advocating for the users to blindly rely on the top result in the list. 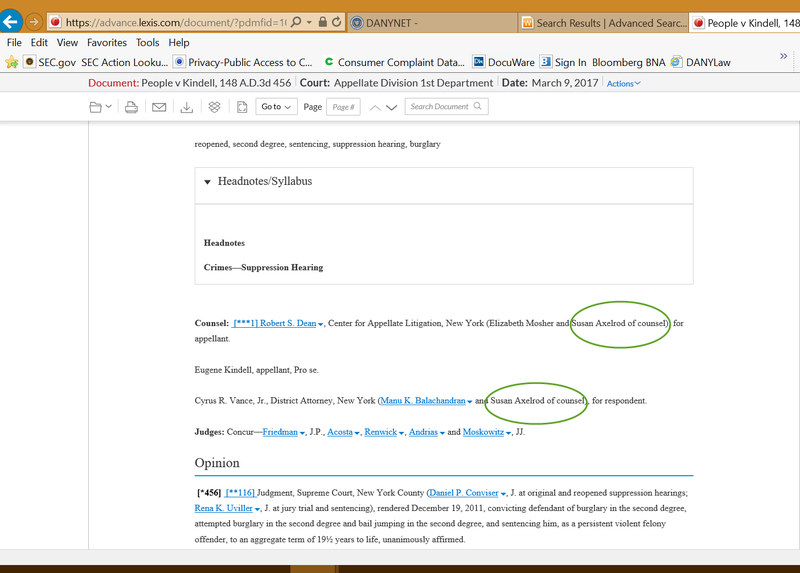 In the Case People v Kindell, 148 AD3d 456 (1st Dept 2017), Susan Axelrod is listed as both the counsel for the Appellant and the Respondent. 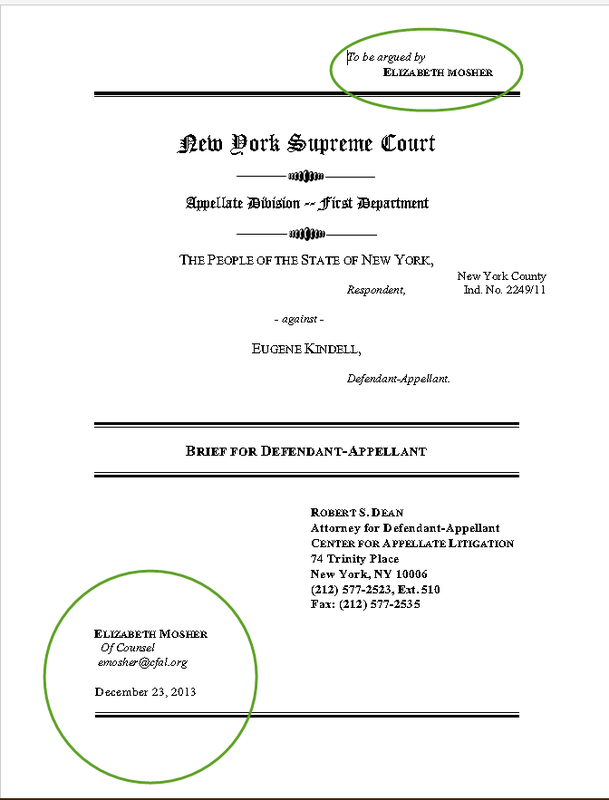 The official version, the print, does not list the attorneys. I confirmed with ADA Axelrod that she did not represent the defendant and opposing counsel was not someone with the same name. 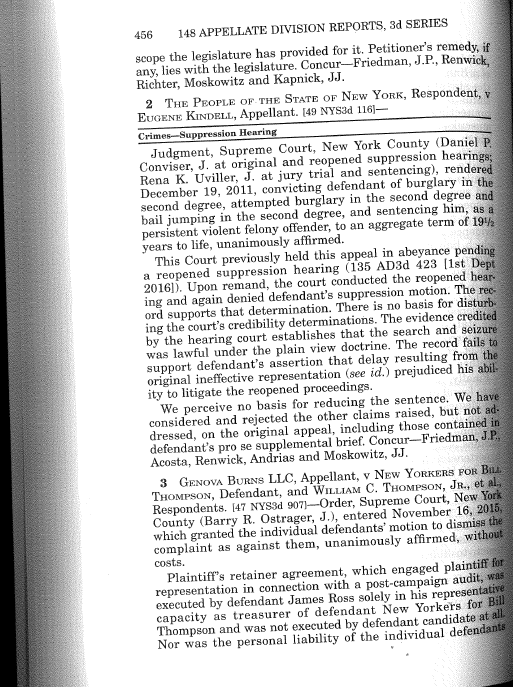 I also checked the defendant’s brief and it lists Ms. Moser as counsel. While these errors are seemingly minute individually, the consequences are greater in the aggregate. My own mentor, a law librarian who had been in the profession for 40 years, kept a print file of the errors that he found in the databases while performing legal research. The file was overflowing by the time I saw it roughly 3 years before his retirement. Because an algorithm’s results are only as good as the underlying data, as we move toward an algorithmic society that relies heavily on algorithmic decision making, these errors could have consequences on the development of the law. Reserve the Student Wellness Room Today! The Law Library in conjunction with the Dean of Student’s Office and the Student Wellness Advisory Committee is very proud to announce the availability of the Wellness Room. This space is designed for students to decompress, de-stress, and rejuvenate. The Wellness Room booking defaults to 30-minutes blocks of time. The Room may be reserved for 1-hour maximum per person, per day. No more than 3 students allowed at one time. The Room should be straightened after use. The Room is intended for TTU Law Student use. Associate Dean Chapman may enter the Wellness Room at any time. If you are finished with the Wellness Room before your reservation has expired, please stop by the Reference & Information Desk and inform the staff so they can adjust the reservation. To reserve the Wellness Room, go to the Law Library’s Room Reservation link for additional information. Author Jamie BakerPosted on October 16, 2018 December 3, 2018 Categories GeneralLeave a comment on Reserve the Student Wellness Room Today! In a recent survey conducted by the Institute for the Advancement of the American Legal System (IAALS), a wide array of legal employers ranked the legal skills and professional competencies and characteristics that they believe new lawyers most need to succeed. (There is a detailed accounting of the study’s results and an explanation of the study’s role within IAALS’s broader project in the summer 2018 edition of The Bar Examiner, pp. 17-26.) The results revealed that legal employers value foundational characteristics and competencies much more than they do foundational legal skills. As noted by The Bar Examiner, [t]he only specific legal skill that reached the top 20 was legal research. What we’re seeing is a serious dissonance between what legal educators (and by extension law students) and legal practitioners think are the most important skills for practice. Most law students are graduating from law school thinking that they have the skills necessary to practice as attorneys, but that opinion is not shared by the profession they hope to enter. In one survey, 95 percent of hiring partners and associates believed that recently graduated law students lacked key practical skills at the time of hiring. In another survey, 76 percent of third-year law students believed that they were prepared to practice law “right now,” while only 23 percent of practicing attorneys believed that recent law school graduates were ready to do their jobs. Interestingly, the 77 foundations identified [in the IAALS Survey] as necessary for new graduates are largely the same across all workplaces, which means that as we begin to identify the overarching learning outcomes that we can—and should—expect of a legal education, we have at least one common goal: the whole lawyer. The article goes on to mention the possibility of legal educators and professionals using the information from this survey to regulate the skills new lawyers truly need when they enter practice. One thing that becomes clearer with every practitioner survey is the importance of legal research skills for practice. This is a good question and one that really depends on the cases that are found during the research process. An article by Douglas K. Norman titled “The Art of Selecting Cases to Cite” in 63 Tex. B. J. 340 (Apr. 2000) does a wonderful job of discussing how to select cases to cite. Seminal Case–This is generally the first case from the highest court to have decided the issue and stated the proposition of law in question. If the proposition was itself a reversal or revision of earlier authority, the seminal case is the reversing or revising case. As the first case to have stated the proposition in question, the seminal case has generally gone into some depth in analyzing the issue and the court’s rationale in a manner that might not be repeated in later cases. Parroting Cases–With a common proposition of law, numerous cases will have simply parroted the language of the seminal case, adding little or nothing to the analysis. Bolstering Cases–In addition to parroting seminal authority, the bolstering case adds new reasoning and analysis to support the underlying proposition of law. Reformulation Cases–These cases take the proposition of the seminal case and either restate it in different terms or refine the analysis in some way that may be more or less helpful to the reader. When, for example, the seminal case was written in the legalistic jargon of the past, the reformulation case may delete the jargon and restate the proposition in plain English. Pseudo-Seminal Case–When the seminal case has been forgotten or lost in the chain of citation, a more recent case will often emerge as the one most courts presently cite as the oldest or most reliable case to support the given proposition. This case effectively takes the place of the lost seminal case. Companion Cases–As I use the term here, companion cases (not to be confused with the more technical use of this term) are parroting cases that have over time been so consistently cited together with the seminal (or pseudo-seminal) authority that they achieve a certain perceived legitimacy and it would now seem awkward to break the habit of citing the companion case together with the seminal authority. Parallel Cases–Occasionally, separate lines of authority for the same proposition develop without any common source; or, perhaps more likely, the original source or seminal case is buried so far back in the chain of citation that it has been all but forgotten. 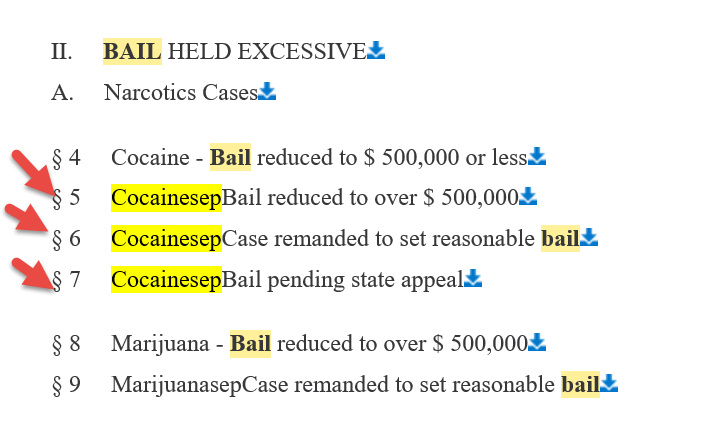 This then leads to two or more lines of cases standing for the same proposition, with different courts typically preferring one or the other of the parallel lines of authority. Storehouse Cases–It sometimes happens that, when there are multiple parallel cases with no clear seminal or pseudo-seminal case to which they all refer, somewhere down the road a particular case will attempt to collect or “storehouse” all of the parallel lines. If this storehouse case is reliable, it is a prime candidate to be cited from then on as pseudo-seminal authority. Selecting the proper cases is part of the underlying analysis required of the legal research process. 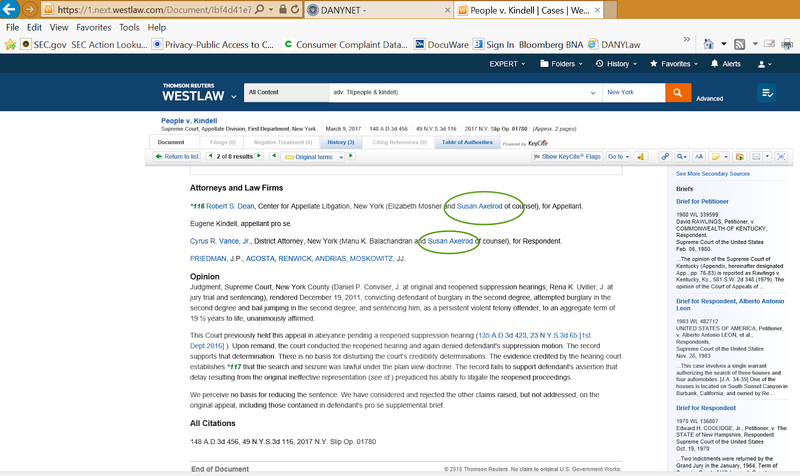 As the author notes, improper case selection may cause the reader to reject the underlying legal proposition, which could be the death knell for a case.